"It's the first time I've visited the site... I really love it! I found the films I've been looking for so long!! It's a blessing to have Christian products with quality!! It's a blessing! Thank you!!! GOD BLESS U!!!!" Filled with simplistic clarity and truth, 40 Nights is an in-depth character story about one of the most known, questioned and mysterious figures in human history. Beginning with the Baptism of Jesus by John the Baptist and taking it through his quest into the wilderness, where Jesus reflects upon his upbringing and the events that shaped his life. It is there he is tempted by the Devil and it is there he must strengthen himself for the real journey ahead. "WE WALK BY FAITH, NOT BY SIGHT." Format: DVD Region 1 What's a Region Code? Miracles happen when you least expect. It's not the destination but the journey. Get ready to feel the power of worship first hand with this live experience! One family's story in America's fastest sport. Finding the Christmas spirit one piece at a time. He holds the key to their future. All they want is the key to his safe. Excellent script about an unknown subject matter. When you try to imagine what was said in a historical situation it is difficult not to step on someone's toes compared with their views of the subject. The dialogue maneuvered very comfortably through these deep waters. Even a stiff neck Christian would appreciate the clever way it was portrayed what Christ might have went through. It was very believable that it could happen that way. The accuracy with Scripture was very pleasing. This allowed me as a viewer to trust the script to take me in any direction. The story line inspires the viewer to think about what could have happened with an open mind. A truly beautiful film. The shooting location looked like right out of the holy land. The cinematography is first-class. The editing of the film was so smooth it was hardly even noticed. You certainly have a great crew working with you. I would give it five stars and encourage all believers to view it. Good job! A great film and it really tells the story of Jesus time in the desert and the struggles he faced. Great acting and the cinematography is fantastic. This was the last film that the iconic actor Dan Haggerty (aka Grizzly Adams) was in. He is heard at the beginning as "the voice of God," which is interesting as he died not long after of January 15th. 2016. Dan was my dear friend and business partner for about 20 years, he was always good with exits, but wow! What a way to go - as the voice of God! 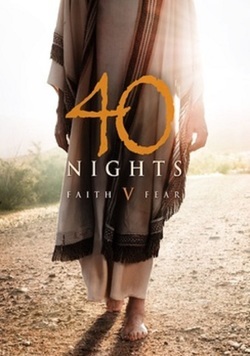 I enjoyed watching the film '40 Nights' and I have to say that it was challenging and encouraging. The film uniquely tells the story of Jesus and the 40 Nights in the wilderness after he was baptized. Beautifully shot in the desert, Jesus is confronted by the enemy. Flashbacks take the viewer back into the life of Jesus and addresses real issues that we all face every day. The film stays true and doesn't try to reshape Biblical truth, it is a glimpse into the lives of those in time of Christ. It portrays the eternal messages in a powerful but simple setting that is enjoyable to watch. It is a film that will build your faith and inspire you as you apply it to your life. The ending is especially direct and challenging. Watch it, you will be glad you did. I recently saw this movie, and I have to say I was very pleasantly surprised. The film covers the time when Jesus spent 40 nights in the desert after he was baptized. In the desert, Jesus is tempted three times by the devil. The filmmakers used Jesus's time in the desert as an opportunity to flash back to other times in Jesus's life. The flashbacks are some of my favorite moments in the film. I also really enjoyed the conversations between Jesus and the devil. In this era of faith-based films, I was relieved to find that this film does not serve as a revisionist version of the Bible. I felt this was an extremely honest version of the story and represented a theologically sound story. This was what caused my pleasant sense of surprise. I am someone who very much enjoyed watching "The Passion of the Christ," but that is also a movie that I have only watched one time, due to the nature of some of the scenes. This is a similar type of movie in terms of its portrayal of Jesus, except that I can see myself watching this movie on a regular basis. The themes of faith and fear are inspiring, and I actually look forward to seeing this movie again. The movie leaves on a high note, and is quite uplifting. The film looks beautiful overall. Some of the desert shots are gorgeous. In total, I was pleasantly surprised by this film, and I would recommend it to anyone who enjoys faith-based movies but also to anyone who is looking for an inspirational movie that will capture your attention. Furthermore, I have purchased multiple copies. I plan to give this movie as a gift!